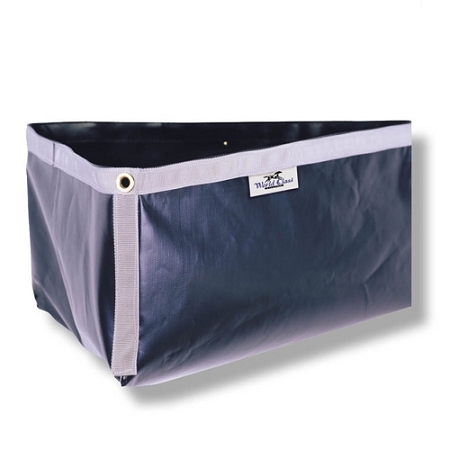 These are the feed bags that commonly come with a brand new slant-load horse trailer and are custom-sewn to fit each stall in your trailer. They are constructed with 14 oz. heavy vinyl, each seam is double-sewn & reinforced with heavy-duty webbing & each features spurred brass grommets. This unique design features no seams on the bottom of the bag. They fasten with double-sided snaps to D-rings on your trailer (not included). These are the most durable feed bags on the market today. Custom sewn to your measurements! Measure trailer stall from right corner under the window to the D-ring on the divider or slant wall (A-B). 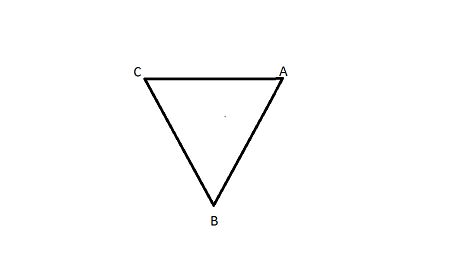 From there, measure over to the front left corner under the window (B-C). Then, from the left side of the window back to the starting point at the right side of the window (C-A). *Choose size XL if your measurements TOTAL over 100 inches or more. **Measure carefully--custom sewn feed bags are not returnable. Ship time: usually ships 10 days after measurements are received, with 1 week shipping via UPS. 4 1/2" double-end snaps are sold separately on the Fasteners page. You may need to install D-Rings in your trailer. D-Rings are sold on the D-Ring page. The feed bag fit perfectly in our new three horse slant load trailer. The quality of the material, grommets and stitching looks like it will last as long as the trailer. I ordered this bag as I could not find one to fit my trailer. Excellent quality. The fabric is one solid piece so there is no coming apart at the seams. The fabric seems to be water proof. Very easy to clean. I would definitely purchase another one, but I think this bag will last a very long time.